211 Bernard: Tonight! Readings by Gail Scott, Gillian Sze, and many more! Tonight! Readings by Gail Scott, Gillian Sze, and many more! 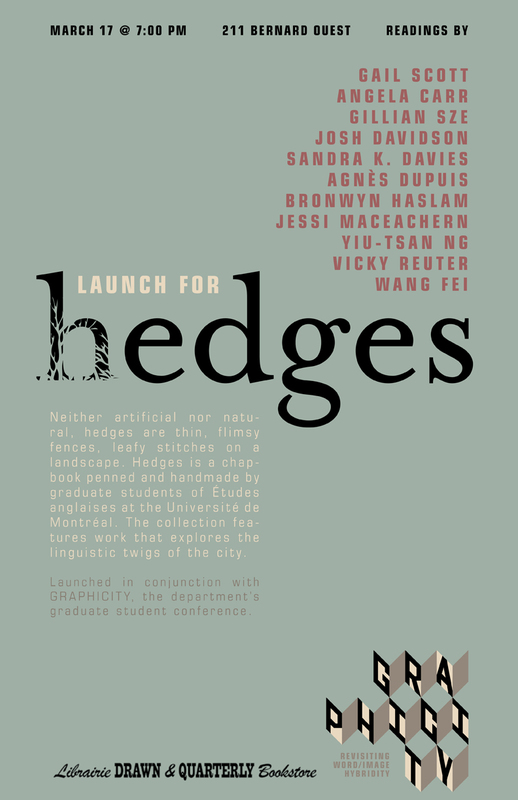 Tonight, Saturday March 17th at 7 pm at the Librairie D+Q, join us for the launch of hedges. This lovely chapbook was not just written by but also hand-crafted by U de M's graduate students in Etudes Anglaises, and features Chinese calligraphy on its cover. Handmade books and tons of awesome Montreal talent. What more could one ask for? Shake off those winter blues and come on down!